Dress up your dining table with style! These unique designs are perfect for entertaining or casual dinners. They are decorative, easy to use and stylish. They will add a touch of elegance to your table and room decor! With tens of 1000's of fresh and modern designs you can find the right tablecloth to match with any tableware, dinnerware, napkins, placemats and other decorations. Great for any occasion and every event at home, party house, hotel, restaurant, cafe. The colorful designs will brighten up your dining room and living room bringing a refreshing touch. Environmentally friendly, no dye substance harming health of your family. Colors won't fade thanks to new digital printing methods. A perfect gift idea for your mom, dad, sister, brother, grandma, grandpa, wife, husband, son, daughter and all other beloved ones with many of surprising designs. You can find a design and theme for everybody and every interest in our Lunarable Amazon Collection. They will be shocked by the superior quality of the item when they open the present. Customized, personalized products are very popular. As manufacturers of digital printed home textiles, we follow current trends and bring you the latest home fashion. Either a gift to your family or best friend, relative or boyfriend, girlfriend, or to yourself, the item should be interesting and authentic. Men, women, kids, teens, boys, girls, everyone will love this item! CARE INSTRUCTIONS: Machine wash on cold delicate cycle with mild detergent and water; Do not bleach. Iron on low heat from the back of the tablecloth if needed. Due to manual measurement, please kindly allow 1-2 cm discrepancy. The digital images we display have the most accurate color possible, however due to differences in computer monitors, we cannot be responsible for variations in color between the actual product and your screen. 60 INCHES WIDE x 84 INCHES LONG - Highly unique. Versatile. FUN. MACHINE WASHABLE - Cold cycle. Easy to clean. Durable enough for both indoor and outdoor use. CREATES - A wonderful and luxurious setting for your family and friends to enjoy together. PERFECT - For any occasion at home, party, hotel, restaurant, cafe, kitchen, dining room. 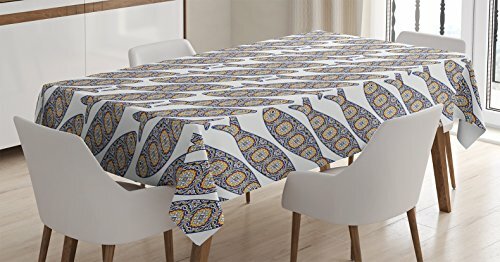 Llama Square Dinner Picnic Table Cloth Pattern with South American Animal Guanaco Cactus and Hand Drawn Childish Elements Waterproof Table Cover for Kitchen Multicolor Size: W36" x L36"